into one of the more pressing yet silent issues that plagues the workforce – mental health and wellbeing. 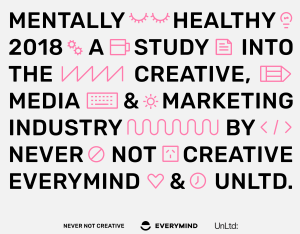 Industry charity UnLtd, Never Not Creative and Everymind have partnered to conduct the widest reaching study into mental health in the media, advertising and marketing, and shed light on how it is impacting individuals and their attitudes towards dealing with it. Burn out is a major issue for an industry notorious for long hours, late nights and a relatively high propensity for alcohol and drug use. But so much of this perception is based on anecdotal evidence rather than data and analysis that identifies the problem. “Through working with our charity partners such as batyr, we know what a critical issue mental ill-health is,” UnLtd CEO Chris Freel said. Never Not Creative supports the wellbeing of people in the creative industry. Founder Andy Wright said “this study will bring robust data backed by credible and proven methodologies to start us on the path to identifying solutions”. Understand the current levels of stigma associated with discussing mental health. The survey has launched this week and will run during August and September with results reported by the end of the year. Everyone working in media, marketing and creative industry is encouraged to complete the Mentally Healthy 2018 survey. The media industry is launching a major study into one of the more pressing yet silent issues that plagues the workforce – mental health and wellbeing.